It started, and might have ended, with a folding bike, which was intended to be my “last” bike. After all, I was headed out of my 40’s and shouldn’t be taking such juvenile pursuits seriously any more. It would live in the trunk of my car, available for a quick spin on level pavement when the opportunity arose. But my son, Alex, just entering middle school, had other ideas. Fascinated by the stunt jumping of freestyle mountain bikers, he bought his first mountain bike and began logging air time. But he needed a driver and companion, so to the mountains we went. When the tiny front wheel of my folding bike sank axle-deep in mud on our first ride, it was obvious I’d need to upgrade to a more capable machine…. I worked through the early stages of the mountain bike learning curve on a couple of different Jamis bikes, purchased from the local bike shop my wife Caroline had befriended. The Jamis’ were worthy machines, good values for the money. They helped me develop lungs and legs to the point that I could climb most hills without dismounting, and descend them again quickly enough to avoid completely losing Alex. Though he always rode well ahead of me, usually out of sight. I taught myself to use “clipless” pedals for efficient pedaling, figuring I needed all the help I could get in keeping up with my son. I also set up a small bike workshop on our back porch, and learned how to tear down and maintain a modern mountain bike. 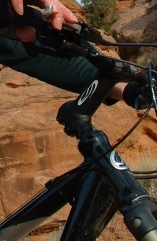 Then the frame on my Jamis cracked after our second trip to Moab. While in the bike shop discussing warranty coverage, I saw it: A gorgeous full-suspension 2006 Santa Cruz Blur LT. A demo bike, with a price that couldn’t be refused. Did I deserve such a high-end bike? I guessed I did, or at least I deserved all the help a father could get in keeping up with his teenage son. The metallic orange color wasn’t my favorite, but the price compensated. I grew to love that color anyway, and the bike. It was the surest-footed of all steeds. In 6+ years and hundreds of miles, on steep and rugged trails across the country, under all conditions, I fell off it only once: when we hit a hidden 3 foot ditch that would have given a Hummer pause. Yes, I loved that bike, and more importantly the almost uncountable adventures it shared with me and my growing son. But alas, things changed, as all things must. Alex moved away to college. And the Blur, sadly, was taken while in a distant city. While mourning the loss of my Blur, I began the search for a new bike. First requirement, given my early-retired budget, and my aging cycling aspirations, was a reasonable price tag. I didn’t need a high-end bike now, and couldn’t stomach spending several thousand again on a possession at such risk for theft. Still, I yearned for something special. I was intrigued by reports on the new crop of 29er hard tails. 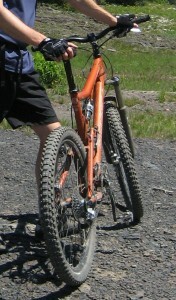 (Mountain bikes with larger, 29-inch wheels and no rear suspension.) 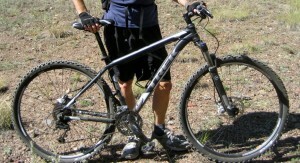 It was said the 29ers rolled over bumps effortlessly, and provided better momentum on flats and climbs. Hard to believe, but the instant I rode one on trail, I could feel the difference. I rented a Trek Mamba for a couple of days while in mountain biking haven Crested Butte, and then bought a new Mamba there. It was a likable bike from the start, and I’ve grown to love and respect it too. It doesn’t have the fine pedigree or smooth handling of the Blur. Yet it cost less than one-third the price, weighs about the same, and may actually be a superior ride on the level, or when climbing. Only on long and rocky downhills do my thoughts go back to the Blur. It was a steady companion on so many journeys among the vicissitudes of life. Like a long-ago romance fated to end with the changing season, memories of that bike still warm my heart, even if they no longer steal it away.